Pretty little Meredith the Mermaid captures all the charm of a magical seaside summer holiday! She has her companion Stella the Starfish by her side as they splash about in the rock pools looking for hidden treasures. Meredith is always keeping an eye out for her favorite pearls to decorate her beautiful crown while Stella searches out baby starfish to play with. 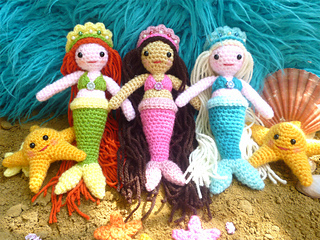 Meredith loves getting together with her fellow mermaids for a chat and a swim. So crochet up a shoal of these little sweeties and there’ll be smiles all round! Easy and quick to crochet. 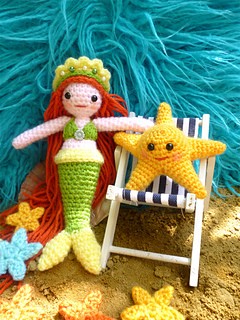 Pattern includes detailed instructions and clear photographs to help you create Meredith, Stella and a whole host of baby starfish too. Using light worsted weight (DK/8 ply) yarn and a size C (2.75mm) hook, Meredith will measure approx. 8” (20cm) tall. Stella measures approx. 4” (10cm) across. Baby starfish come in two sizes and are less than 1 - 2” across.